This is just a quick blog post to show some recently finished (leatherhard) wire baskets, and let you know what’s coming up in my schedule. 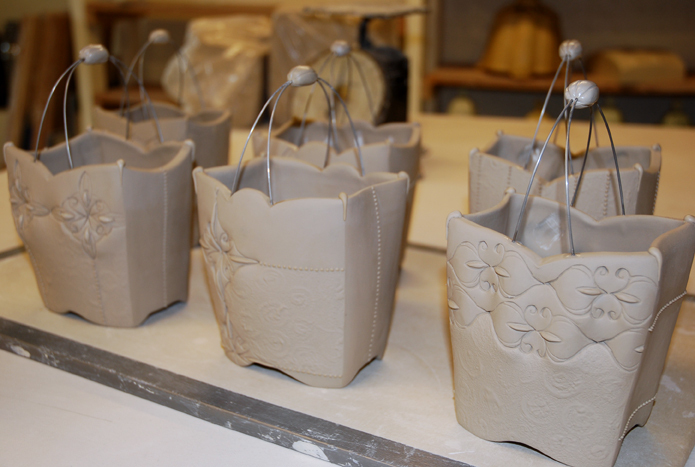 First, the Small Wire Flower Baskets. 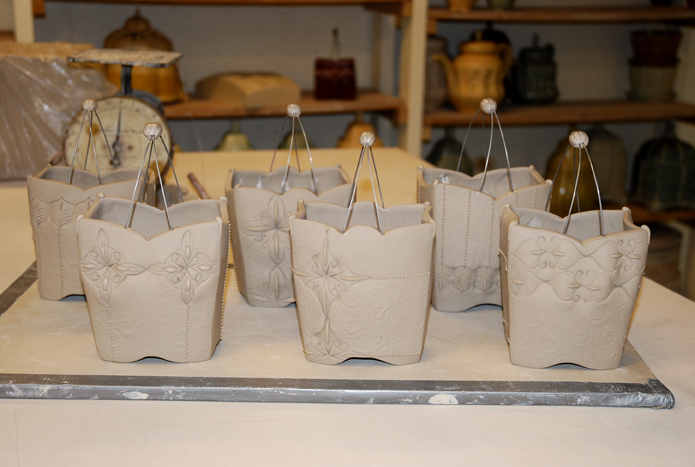 These little pieces (7-8″h) were thrown on the potter’s wheel, altered, stamped, built and finally, finished with slip-trailing and sponging accents and of course, the wire. 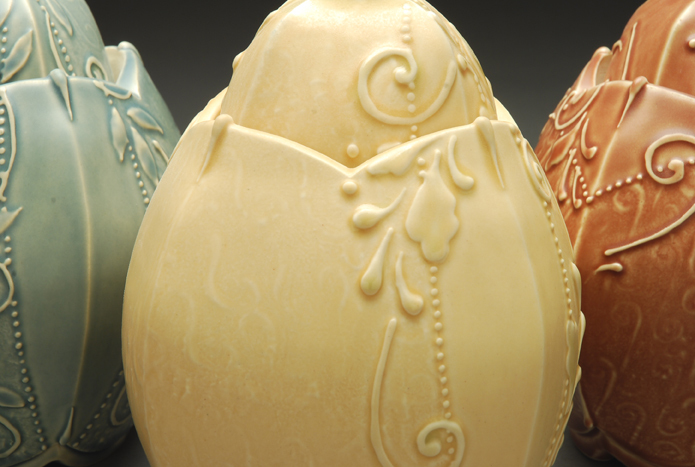 I will post the finished (glaze-fired) pieces in a couple of weeks. I see these as small variations on the Wire Flower Brick I began making in 2005 (image in last post and some explanation of Kanthal wire on my Process page). I imagine them to also be used for flowers; small, informal bouquets maybe from your garden. This week is the end of a short making cycle specifically for new work to send to both Red Star Studios and Northern Clay Center for a July show and gallery feature, respectively. 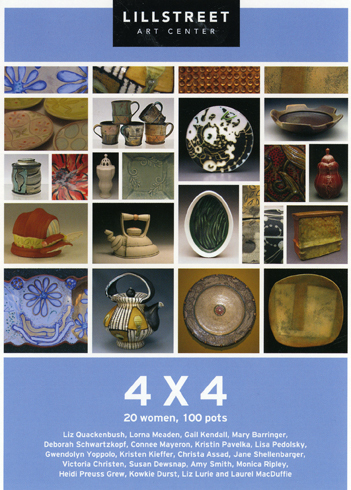 This week is also the opening of the 4 x 4: Twenty Women, 100 Pots show at Lill Street. This should be an outstanding show with an amazing range of pots to behold. Thank you to my fellow OU alum Lorna Meaden for the invitation! For the month of July, I will be teaching a Monday afternoon class at Harvard University’s Ceramics Program. The class is getting full, so if you have interest, sign up now, and I hope to see you. Details for all of these events are on my Schedule page. Lastly, just a reminder that you can still receive two postcards from me (details here), and a recommendation to become a FaceBook fan of Kieffer Ceramics. Because I can post a quick sentence, the fans are the first to enjoy new images and updates. I have a fondness for take out chinese boxes. I painted a still life of some one time. I see your baskets and think of those chinese take out boxes. If I can get tenure with the school system I teach with, then I will spend more money on my collection and buy some of your work. I am a fan. Those new wire baskets are just lovely. You have such a full schedule, have fun. If I was closer I’d sign up for the Monday afternoon classes.